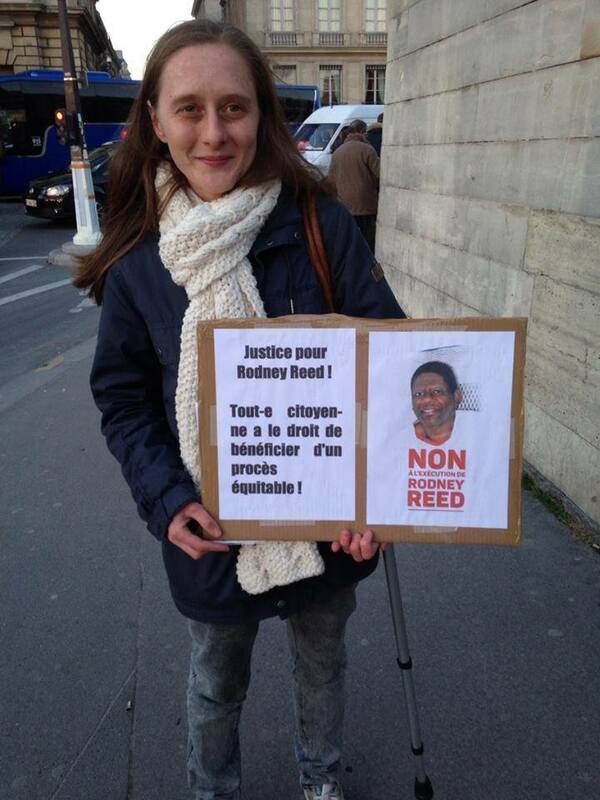 A new piece from the Campaign to End the Death Penalty outlines the current status of the case of Rodney Reed and describes all the hard work by activists, lawyers, filmmakers, investigators and journalists that lead the recent stay of execution and the uncovering of new evidence. 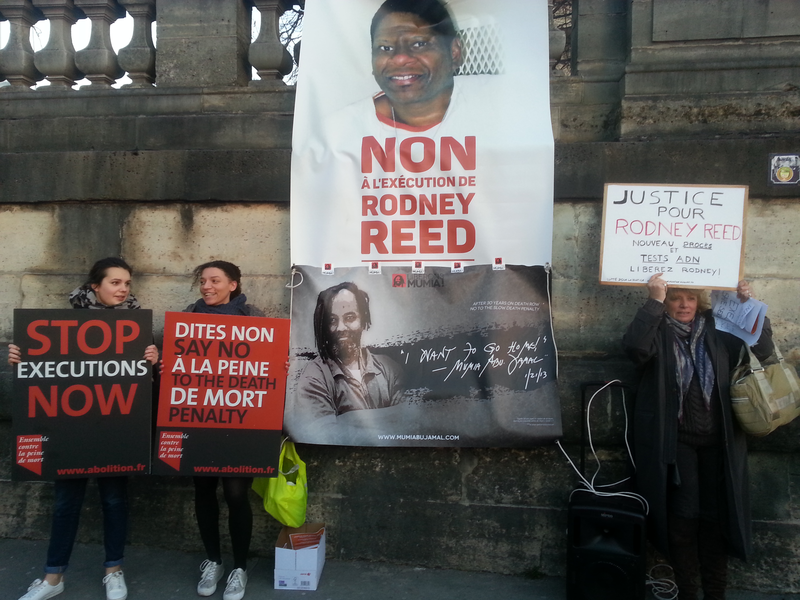 Although Rodney has been given a stay of execution, the fight is far from over. The Court has agreed to look at Rodney’s new appeal, but there are no guarantees of a favorable ruling. One possibility is that the court could look at the evidence and opt to deny relief, as they have done in the past. Another possibility is that the CCA could order a new trial. This wouldn’t be unwelcome to Rodney and his supporters. However, if the evidence of innocence is strong enough to warrant a new trial, then it would make better sense for the court to reverse the conviction altogether. The best possible outcome from the CCA would be a reversal of Rodney’s conviction and for Rodney to be released from prison. 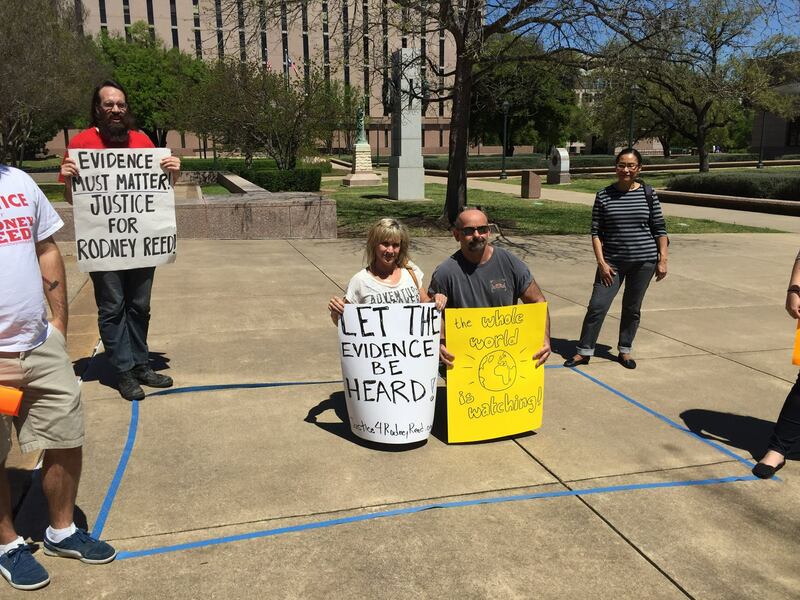 In this event, the Bastrop County district attorney could still opt to take Rodney to trial again, in which case activists should demand that the DA drop Rodney’s indictment completely. 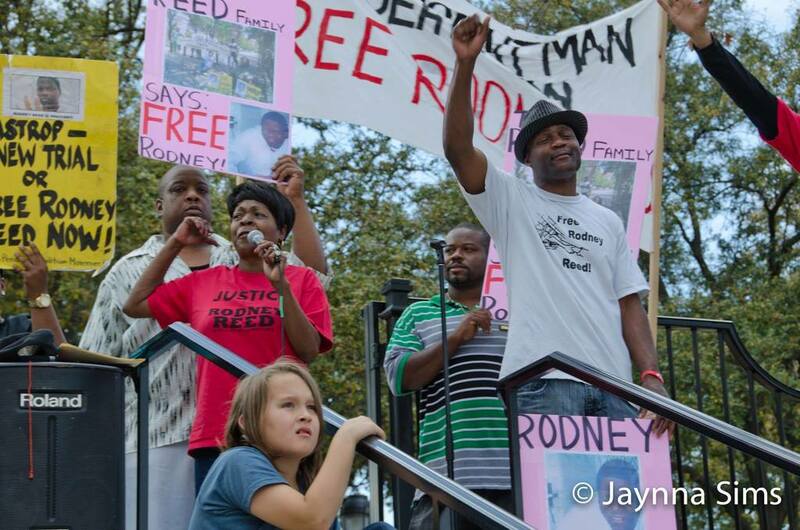 The article is a great comprehensive of the history of the campaign to demand justice for Rodney, a campaign that continues! This site will be updated as soon as the Court issues a ruling. This entry was posted in Death Penalty News and tagged Austin, Court of Criminal Appeals, Death Penalty News, Innocence, Justice4Rodney on May 27, 2015 by justice4rodneyreed. The Texas Tribune reports that the Texas Senate has approved a bill that would hide the names of execution drug providers from the public. Senate Bill 1697 passed 23-8. State Sen. Joan Huffman, R-Houston, told lawmakers her legislation was a “practical solution” to the harassment and threats faced by companies providing the state prison system with pentobarbital, the single drug used in Texas to execute inmates convicted of capital murder. Hiding the names of unscrupulous pharmaceutical companies is a new development in Texas’ embarrassing history of capital punishment. Because these businesses have contracts with the state, their names were available to public until just two years ago. After European-based companies refused to sell their supplies of pentobarbital if its intended purpose was the murder of human beings, Texas turned to The Woodlands Compounding Pharmacy for its lethal drugs in 2013. The Woodlands Compounding Pharmacy claims that the public knowledge of their shady deal lead to “threats” against their business. If companies can’t conduct their tax-funded business with the state in the public view, then they shouldn’t be in this shameful business at all. It’s telling that state lawmakers can band together to protect pharma manufacturers from the “chilling effect” of public outcry, but do nothing to secure justice for the wrongfully incarcerated. The Texas Legislature has again reaffirmed its commitment to executions, but abolitionists in Texas and across the world won’t stop until there’s justice for Rodney Reed and the other men and women on death row. This entry was posted in Death Penalty News and tagged Austin, Death Penalty News, Justice4Rodney, pentobarbital, Texas Capitol, Texas Legislature on May 12, 2015 by justice4rodneyreed. 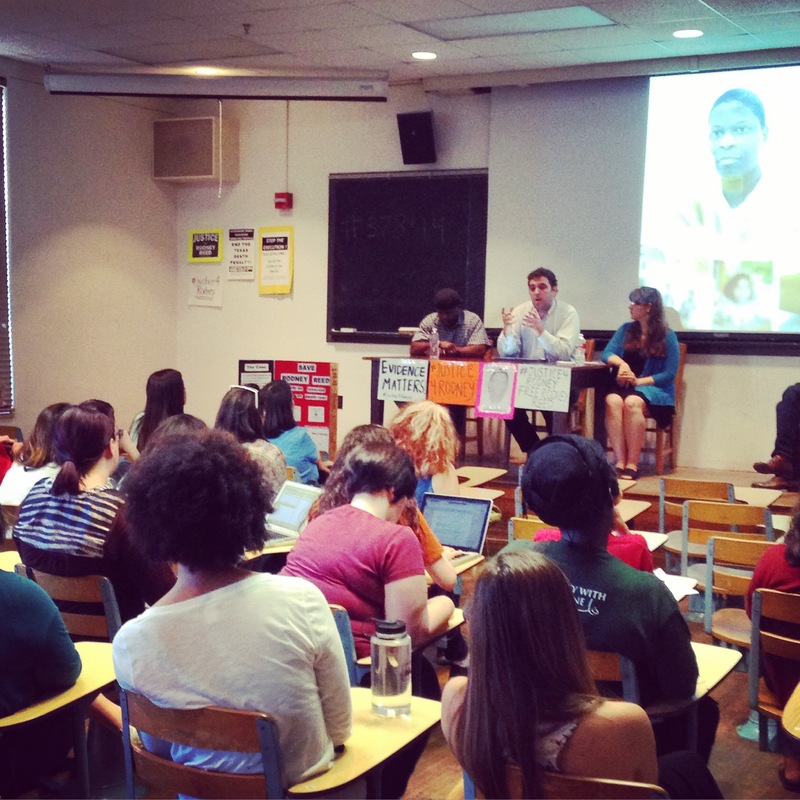 Rodrick Reed, brother of Rodney, spoke to a University of Texas at Austin students last night. The panel followed a die-in hosted a few days earlier in one of the University’s busy pedestrian areas. 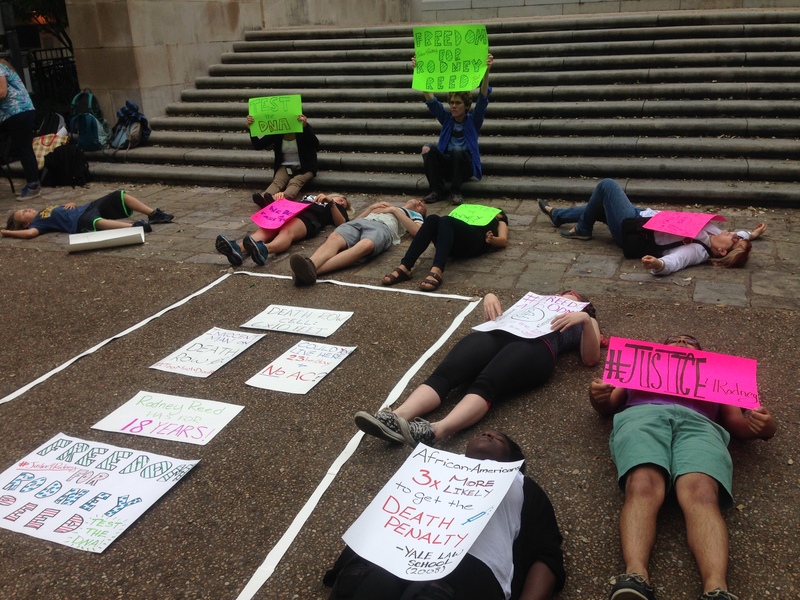 The die-in highlighted Rodney’s case but also the oppressive conditions of Texas death row. A 6 foot by 10 foot area was marked off on the ground, representing the size of a death row cell. 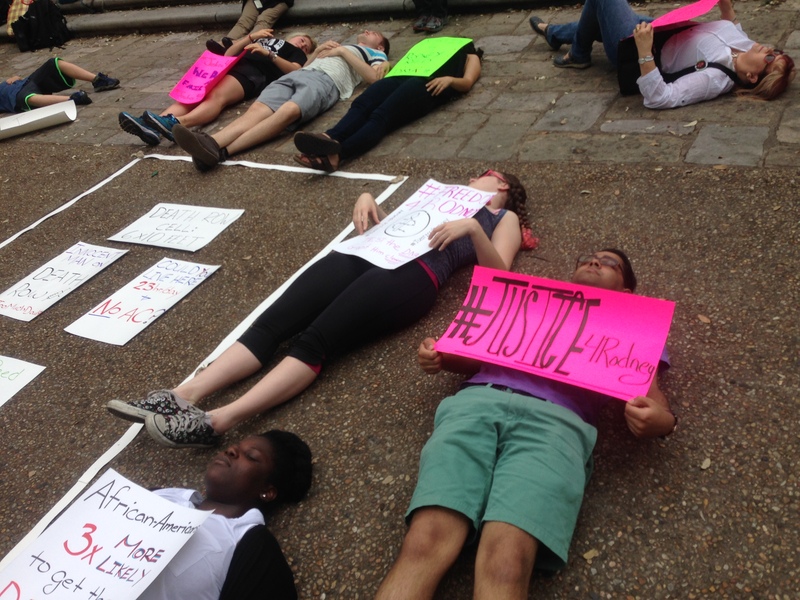 Demonstrators lay down on the pavement for 10 minutes with signs about Rodney and the racist application of the death penalty. 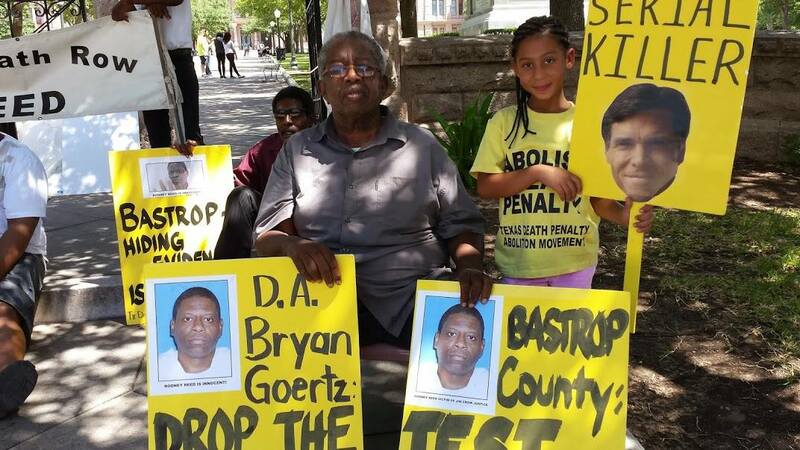 This entry was posted in Death Penalty News and tagged Amnesty International, Austin, Innocence, Justice4Rodney, news coverage, Rodrick Reed, University of Texas on April 28, 2015 by justice4rodneyreed. 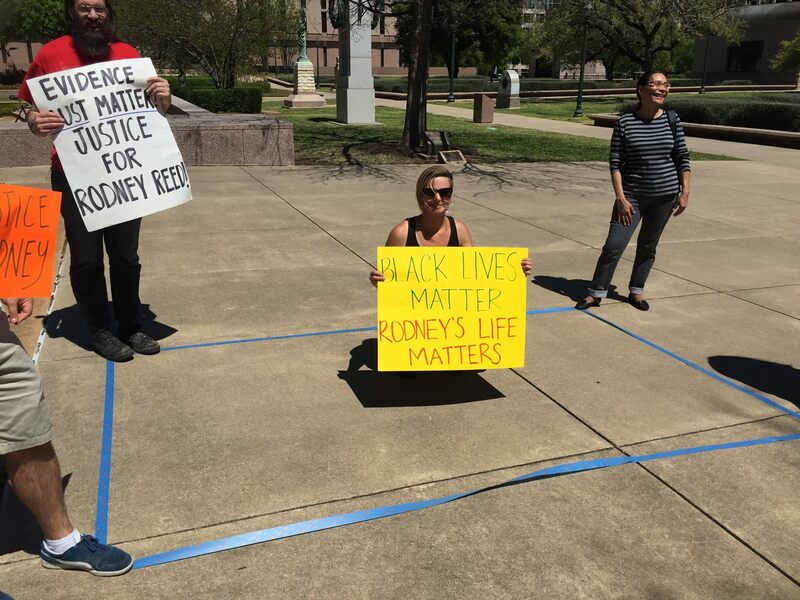 Students at the University of Texas at Austin will hold a die-in on Thursday, April 23, to show their continued support of death row prisoner Rodney Reed. The students will table in the hour leading up to the die-in, which starts at 12:15 pm. The event will include a replica of the floor plan of cells on Texas death row to highlight the harsh conditions of death row, as profiled in this report by the ACLU. Texas has some of the most restrictive policies in the nation, with prisoners held in solitary confinement for 23 hours per day, in tiny cells with one small window, no television, no air conditioning, and no contact visits. No prisoners should live in this way, especially not an innocent man like Rodney. 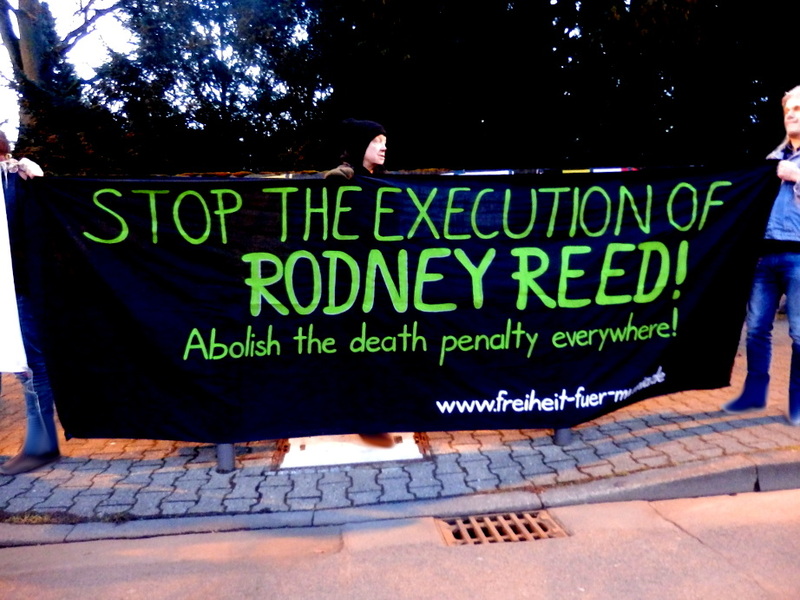 Although grateful for his stay of execution, activists say Rodney shouldn’t spend one more day in his 6′ x 10′ cage. More information about the students’ die-in is available on Facebook. You can see inside the Polunsky Unit, home to Texas death row, courtesy of this blog post at Minutes Before Six. The pictures were obtained by a Freedom of Information Act request and annotated by a Texas death row prisoner. A panel discussion on Rodney, featuring Rodney’s brother Rodrick Reed and UT Amnesty International Vice President Ana Hernandez, will take place at UT on Monday, April 27 at 7:00 pm. Details are available here. 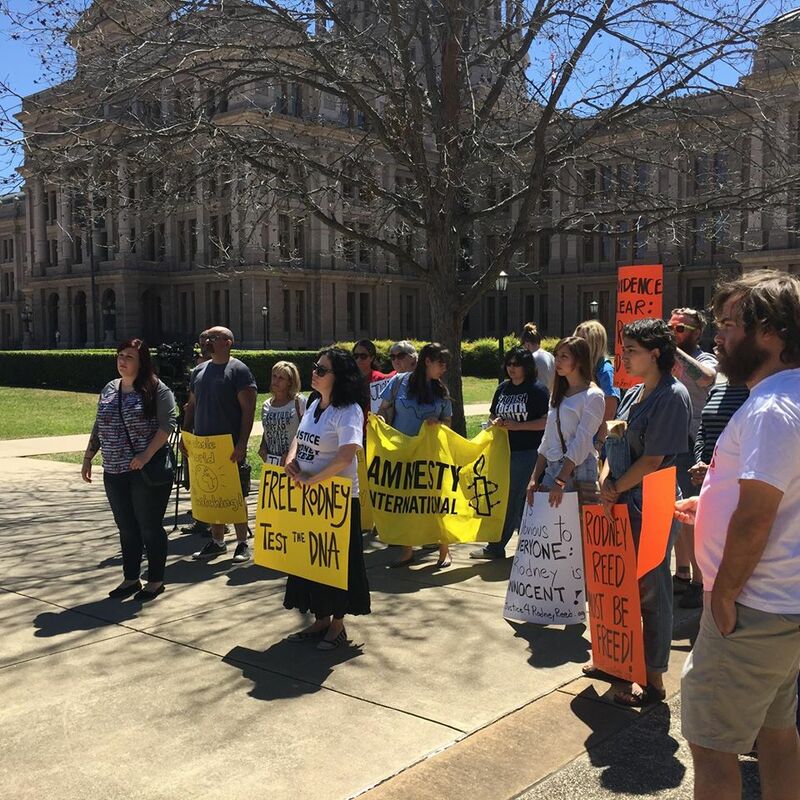 The Campus Coordinating Committee to Free Rodney Reed has hosted many actions on UT campus over the past several months, including a flash mob, collecting Valentines for prisoners, and an all-night vigil. Email cpoirot@utexas.edu for more info. This entry was posted in Protest and tagged Amnesty International, Austin, Innocence, Justice4Rodney, Rodrick Reed, University of Texas on April 21, 2015 by justice4rodneyreed. It is with great sadness that we learned Rodney’s father, Walter Reed, passed away last night. He had been suffering from a heart ailment for some time, with his condition worsening over the last few months; his wife Sandra had been his full time caregiver. This was all happening while Rodney was fighting for his life, so it has been a very difficult time for the Reed family. We are all so sad that Walter wasn’t able to live to see Rodney freed, but we’ll all keep fighting. Rest in Peace, Walter Reed. This entry was posted in Death Penalty News and tagged Justice4Rodney, Walter Reed on March 28, 2015 by justice4rodneyreed. Details are few, but Fox reports that the Texas Court of Criminal Appeals (CCA) will begin its review of Rodney’s case. A ruling as to whether the court will accept the affidavits filed on February 12 by Rodney’s defense is expected sometime in April. Rodney’s supporters will remind the CCA that the world is still watching this case with a protest on Saturday, March 28. Protesters will gather outside the CCA building in Austin at 1:00 PM to demand freedom for Rodney Reed. Rodney Reed was granted a stay by the CCA just ten days before his scheduled execution of March 5th, in a 6-3 vote. This temporary reprieve is a victory for Rodney’s family and the hundreds of thousands of people who believe Rodney’s case is a gross miscarriage of justice. However, Rodney remains on death row, spending 23 hours each day in a 6ft x 10ft cell. Conditions on Texas death row are among the harshest in the United States, with prisoners kept in near solitary confinement. This has been Rodney’s reality for almost 18 years. 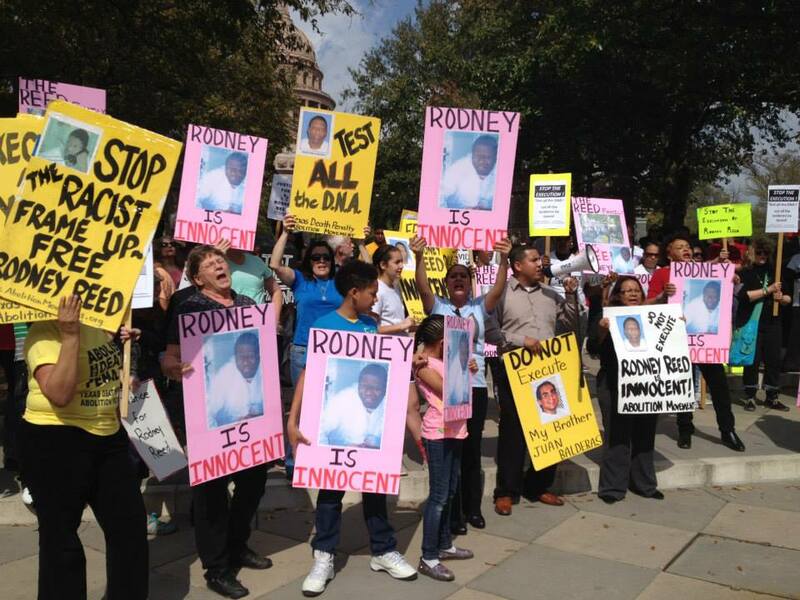 The CCA has the power to allow DNA testing in Rodney’s case and we must demand they do this, and do it quickly. This entry was posted in Protest and tagged Austin, Court of Criminal Appeals, Innocence, Justice4Rodney on March 18, 2015 by justice4rodneyreed. 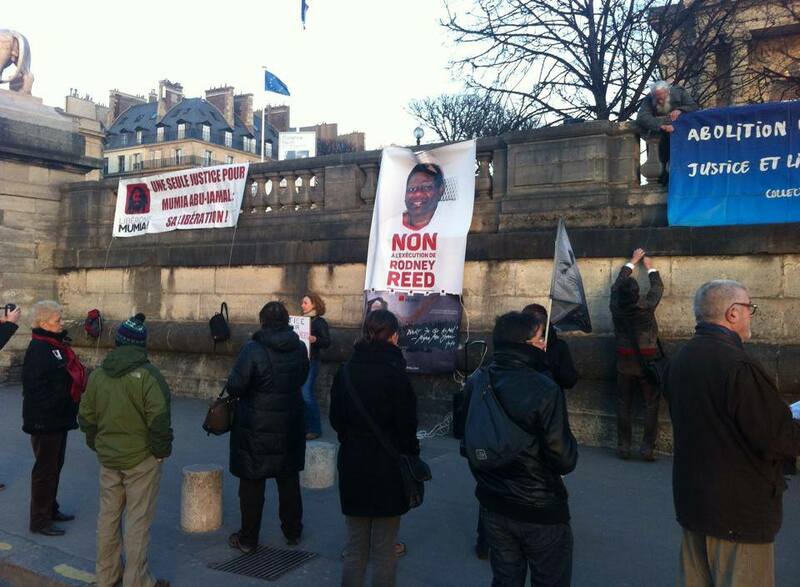 Last week, supporters of Texas death row prisoner Rodney Reed held demonstrations in Paris, France, and Frankfurt, Germany. 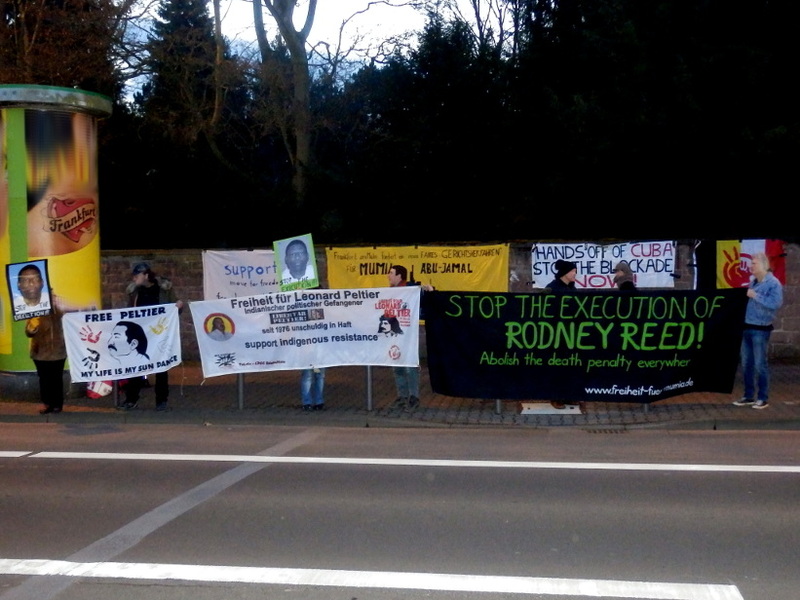 Protesters called for justice for Rodney and an end to all executions. 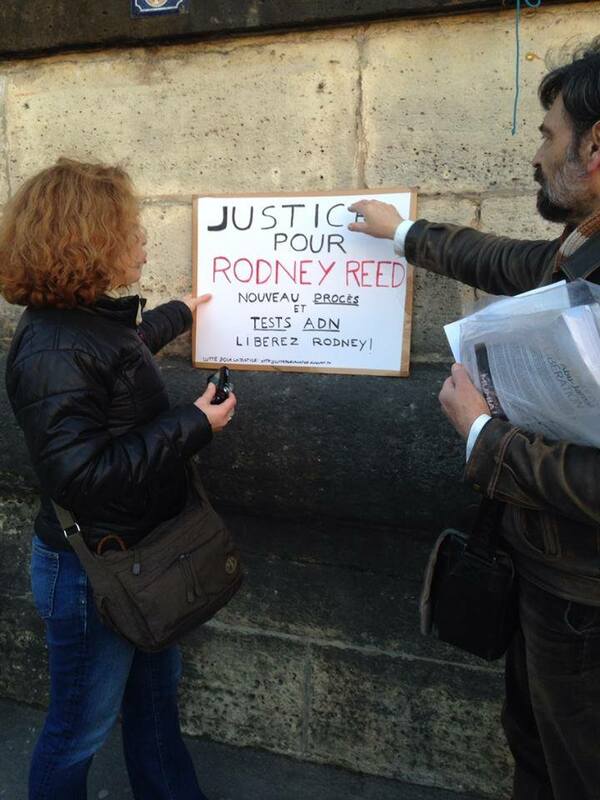 Supporters in Paris say: Justice for Rodney Reed. New trial and DNA tests. Free Rodney! These displays of international solidarity followed a March 1st demonstration in Berlin that drew 80 people. Thanks to Free Mumia France, Mouvement contre le racisme et pour l’amitié entre les peuples (MRAP), Action des Chrétiens pour l’Abolition de la Torture (ACAT), Lutte pour la Justice (LPJ), Communauté de Sant’Egidio. 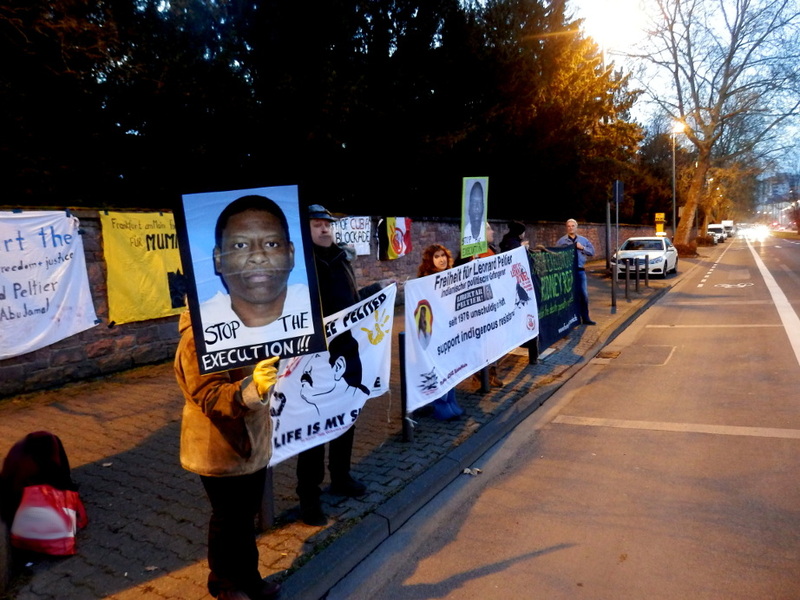 SAVE Innocents, Ensemble contre la peine de mort (ECPM), Ligue des droits de l’Homme (LDH), Free Mumia Coalition Frankfurt, Gabs, and Annabelle Gabriel! This entry was posted in Protest on March 9, 2015 by justice4rodneyreed.